The children being mentored through Sisters Circle of Friends were gifted with more than just warm hats last Thanksgiving. They received the work of loving hands that created those hats especially for them. And so it is with every single item handcrafted by the members of the three Heartwarmers groups in Sisters, Bend, and Redmond. What started as a small seed of an idea in the heart of Fryrear resident Mary Tomjack three years ago this month has become a full-blown garden of delightful color, creativity, and caring. After Tomjack received a gift of a cut-and-tie fleece blanket from a friend, she envisioned a new charitable effort to provide those blankets to Central Oregon residents in need. That idea has attracted many like-minded generous hearts to help Tomjack's dream grow beyond her wildest imagination. Walk into the council chambers at Sisters City Hall any first or third Tuesday afternoon between 1 and 2:30 p.m., and you will be engulfed by the warmth, love, and creative energy of the people gathered around the large tables, cutting and tying colorful fleece blankets as they amiably chat with neighbors, friends, and newcomers. Whenever someone new arrives, Tomjack tells them, "Just bring scissors and a smile," and she always has extra scissors. In three years, Heartwarmers has become a 501(c)(3) charitable organization that creates not only fleece blankets, but also fleece and knitted hats, scarves, baby blankets, lap robes, capes, and ponchos for 26 Central Oregon agencies. A very special addition to the Heartwarmers' efforts are the teddy bears knitted on a round loom and stuffed by retired postal worker John Nelson of Redmond and assembled by his mother, Joyce Miles, who sews them together and adds a fleece heart and a bow to each bear. 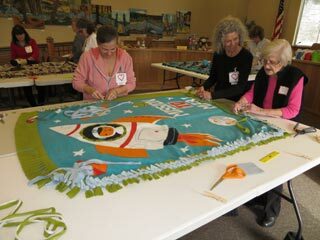 They have contributed 784 bears, each one requiring five hours from start to finish. Those bears get bundled with the blankets that go to children at places like Sparrow Clubs of Central Oregon, Treehouse Therapies, and Family Action Network. "It gives me a good feeling to know that the bears are going to children in need," Nelson said. The cancer treatment centers at St. Charles and Bend Memorial Clinic in Bend and Redmond are given adult blankets that get packaged with lotion, socks, hats, and bandanas for patients receiving chemotherapy. Since starting three years ago, the three groups combined have donated 2,319 blankets. If Tomjack has her way, every homeless teen, abused toddler, sick child, lonely elder, and tiny premie will be wrapped in the loving warmth of a Heartwarmers blanket. She is always on the lookout for new agencies that can use any of the items they create - and the list of agencies and items keeps growing. The Sisters Heartwarmers, the largest of the three groups, created colorful tutus for the little girls at Morningstar Family Relief Nursery. KIDs Center asked them to make child-sized examination gowns, which they sewed using colorful children's fabrics. The left-over scraps were assembled into a quilt by Sisters resident Wilma (Sam) Manasee and presented along with the gowns. A welcome addition to the blankets for the cancer treatment centers are fleece hats crafted by a Sisters group coordinated by Aspen Lakes resident Jane Krause of Plain Jane Gifts. Dee Thompson, Susan Sanger, Judi Troike, Lori Chase, and Paula Price cut and sew the hats, which are accessorized with decorative buttons and pins or flowers made from fleece scraps. In fact, not one shred of fleece is thrown away, giving rise to their "no waste" policy. Scraps are used to stuff soft blocks for agencies serving infants and toddlers. The selvages, cut off the fleece before the blankets are made, are braided into dog and cat toys by Kathryn Killian of Sisters, and given to animal shelters and Sisters Furry Friends Foundation. Dave Huni of Sisters set up the Heartwarmers Facebook page and donates IT help. Monetary donations are only used to purchase fleece, a few office supplies, and to provide insurance for the organization. Everything else is donated including accounting and legal help. Yarn used for all knitted items is purchased by the volunteers, as are the items bundled with the blankets for the cancer centers. The Pony Express gives Heartwarmers a special shipping rate on the baby blankets and knitted hats that are sent to the newborn intensive care units at Portland's Emanuel Hospital and soon at Dornbecher Hospital. Last February Heartwarmers was the recipient of $445.23, the donated proceeds from Sisters Business of the Year, The Open Door's 10 percent on Tuesdays that is gifted each month to a local nonprofit. They have been designated again to receive it this year for the month of February. Storage of all the fleece and finished products has displaced Tomjack's cars from their garage for the last three years, but with their house on the market, new donated space must be found soon. The long-term goal for Heartwarmers is to set up groups in other Central Oregon communities, but for now their blankets and other gifts will continue to comfort the vulnerable among us, as reflected in this year's goal shared by Tomjack. "We will continue as we are and seek to gift more nonprofits." For more information visit www.heartwarmersco.org, their Facebook page HEARTWARMERS, or contact Mary Tomjack at 503-880-5832 or hwb.heartwarmers@gmail.com.